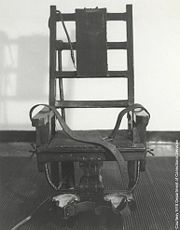 An electric chair used for capital punishment by electrocution. An electric shock is the effect of passing an electric current through the body. The minimum current a human can feel is thought to be about 1 milliampere (mA). The effect can range from minor tingling to muscle spasms, tissue damage, fibrillation of the heart, loss of consciousness, and even death. These effects depend on a variety of factors, including the strength of the current, duration of the current, the area of the body through which the current passes, and whether the person is grounded or insulated from the ground. Death caused by an electric shock is referred to as electrocution. To avoid injury by an electric shock, untrained personnel should not work with exposed live conductors. Such work needs proper training and equipment such as insulated gloves and tools. Under carefully controlled conditions, electric shock may be used for certain medical treatments, such as when treating mental illness, pain, or irregular heartbeats. On the other hand, electric shock has been used as a means of torture and for capital punishment. The perception of electric shock can vary, depending on the voltage, duration, current, path taken, frequency, and other factors. Current entering the hand has a threshold of perception of about 5 to 10 mA for direct current (DC) and about 1 to 10 mA for alternating current (AC) at a frequency of 60 hertz (Hz). Shock perception declines with increasing frequency, ultimately disappearing at frequencies above 15-20 kHz. Heating due to resistance can cause extensive and deep burns. Voltage levels of 500 to 1,000 volts tend to cause internal burns due to the large energy (which is proportional to the duration multiplied by the square of the voltage) available from the source. Damage due to current is through tissue heating. In some cases, 16 volts might be fatal to a human being when the electricity passes through organs such as the heart. A low-voltage (110 to 220 V) alternating current of 50 or 60 Hz through the chest for a fraction of a second may induce ventricular fibrillation, when the current is as low as 60 mA. With direct current, 300 to 500 mA is required. If the current has a direct pathway to the heart (e.g., via a cardiac catheter or other kind of electrode), a much lower current of less than 1 mA, (AC or DC) can cause fibrillation. Fibrillations are usually lethal because all the heart muscle cells move independently. Above 200 mA, muscle contractions are so strong that the heart muscles cannot move at all. The current may interfere with control of the nervous system, especially over the heart and lungs. Repeated or severe electric shock that does not lead to death has been shown to cause neuropathy. When the current path is through the head, it appears that, with sufficient current, loss of consciousness almost always occurs swiftly. This is borne out by some limited self-experimentation by early designers of the electric chair and by research from the field of animal husbandry, where electric stunning has been extensively studied. Approximately 80 percent of all injuries and fatalities caused by electrical incidents are not caused by electric shock, but by the intense heat, light, and pressure wave (blast) caused by electrical faults. The arc flash in an electrical fault produces the same type of light radiation from which electric welders protect themselves using face shields with dark glass, heavy leather gloves, and full-coverage clothing. The heat produced may cause severe burns, especially on unprotected flesh. The blast produced by vaporizing metallic components can break bones and irreparably damage internal organs. The degree of hazard present at a particular location can be determined by a detailed analysis of the electrical system, and appropriate protection worn if the electrical work must be performed with the electricity on. Other issues affecting lethality are frequency, which is an issue in causing cardiac arrest or muscular spasms, and pathway—if the current passes through the chest or head there is an increased chance of death. From a main circuit or power distribution panel the damage is more likely to be internal, leading to cardiac arrest. The comparison between the dangers of alternating current and direct current has been a subject of debate ever since the War of Currents in the 1880s. AC tends to cause continuous muscular contractions that make the victim hold on to a live conductor, thereby increasing the risk of deep tissue burns. On the other hand, mains-magnitude DC tends to interfere more with the heart's electrical pacemaker, leading to an increased risk of fibrillation. AC at higher frequencies holds a different mixture of hazards, such as RF burns and the possibility of tissue damage with no immediate sensation of pain. Generally, higher frequency AC current tends to run along the skin rather than penetrating and touching vital organs such as the heart. While there will be severe burn damage at higher voltages, it is normally not fatal. It is sometimes suggested that human lethality is most common with alternating current at 100–250 volts. However, death has occurred outside this range, with supplies as low as 32 volts and supplies at over 250 volts frequently causing fatalities. Electrical discharge from lightning tends to travel over the surface of the body causing burns and possibly respiratory arrest. The voltage necessary for electrocution depends on the current through the body and the duration of the current. Using Ohm's law, Voltage = Current × Resistance, we see that the current drawn depends on the resistance of the body. The resistance of the skin varies from person to person and fluctuates between different times of day. In general, dry skin is a poor conductor that may have a resistance of around 100,000 Ω, while broken or wet skin may have a resistance of around 1,000 Ω. The capability of a conducting material to carry a current depends on its cross section, which is why males typically have a higher lethal current than females (10 amperes vs. 9 amperes) due to a larger amount of tissue. However, death can reportedly occur from currents as low as 30 milliamperes. 0.01-0.02 A 100-200 V 10-20 V 1-4 W Sustained muscular contraction. "Cannot let go" current. 0.1-0.3 A 1000-3000 V 100-300 V 100-900 W Ventricular fibrillation. Can be fatal. 6 A 60,000 V 6,000 V 400,000 W Sustained ventricular contraction followed by normal heart rhythm. These are the operation levels for a defibrillator. Temporary respiratory paralysis and possibly burns. Macroshock: Current across intact skin and through the body. Current from arm to arm, or between an arm and a foot, is likely to traverse the heart, therefore it is much more dangerous than current between a leg and the ground. Microshock: Direct current path to the heart tissue. To prevent the danger of an electric shock, it is highly recommended that people avoid working on exposed live conductors if at all possible. When such work needs to be done, insulated gloves and tools should be used. If both hands make contact with surfaces or objects at different voltages, current can flow through the body from one hand to the other. This can lead the current through the heart. Similarly, if the current is from one hand to the feet, significant current will probably flow through the heart. An alternative to using insulated tools is to isolate the operator from ground, so that there is no conductive path from the live conductor, through the operator's body, to ground. This method is used for working on live high-voltage overhead power lines. It is possible to have a voltage potential between neutral wires and the ground in the event of an improperly wired (disconnected) neutral, or if it is part of certain obsolete (and now illegal) switch circuits. The electrical appliance or lighting equipment might provide some voltage drop, but not nearly enough to avoid a shock. "Live" neutral wires should be treated with the same respect as live wires. Also, the neutral wire must be insulated to the same degree as the live wire to avoid a short circuit. Electrical codes in many parts of the world call for installing a residual-current device (RCD or GFI, ground fault interrupter) in electrical circuits thought to pose a particular hazard to reduce the risk of electrocution. In the United States, for example, a new or remodeled residential dwelling must have them installed in all kitchens, bathrooms, laundry rooms, garages, and also any other room with an unfinished concrete floor, such as a workshop. These devices work by detecting an imbalance between the live and neutral wires. In other words, if more current exits through the live wire than is returning though its neutral wire (presumably via ground), it assumes something is wrong and breaks the circuit in a tiny fraction of a second. There is some concern that these devices might not be fast enough to protect infants and small children in rare instances. Concrete contains a residual amount of water that makes it somewhat electrically conductive. Also, concrete in contact with any source of water or moisture will absorb some, and the water in concrete always contains dissolved minerals that makes the water significantly conductive. The plumbing system in a home or other small building has historically used metal pipes and thus been connected to ground through the pipes. This is no longer always true because of the extensive use of plastic piping in recent years, but a plastic system cannot be relied upon for safety purposes. Contrary to popular belief, pure water is not a good conductor of electricity. However, most water is not pure and contains enough dissolved substances (salts) to greatly enhance its conductivity. When the human skin becomes wet, it allows much more current than the dry human body would. Thus, a person in the bath or shower will not only ground the person to return path of the power mains, but lower the body's resistance as well. Under these circumstances, touching any metal switch or appliance that is connected to the power mains could result in severe electric shock or electrocution. While such an appliance is not supposed to be live on its outer metal switch or frame, it may have become so if a defective live bare wire is accidentally touching it (either directly or indirectly via internal metal parts). It is for this reason that mains electrical sockets are prohibited in bathrooms in the United Kingdom. However, the widespread use of plastic cases for everyday appliances, grounding of these appliances, and mandatory installation of Residual Current Devices (R.C.D.s) have greatly reduced this type of electrocution in recent decades. Connecting electrical neutrals to plumbing is against electrical codes, at least in the United States of America, for several reasons. One reason is that connecting any electrical lines to plumbing presents a danger to plumbers or anyone else working on or around plumbing. Also, with metallic plumbing, even small amounts of electric current through them over a significant length of time can cause corrosion of the pipes, removal of their zinc linings (if any), and breakdown of the solder in their joints. The ground wire (grounding conductor) of the system is allowed to be connected to plumbing. However as previously stated, the neutral (grounded conductor) is not allowed to be connected. A properly grounded appliance greatly reduces the electric shock potential by causing a short circuit, if any portion of the metal frame (chassis) is accidentally touching the live wire. This will cause the circuit breaker to turn off or the fuse to blow resulting in a power outage in that area of the home or building. Often there will be a large "bang" and possibly smoke that could easily scare anyone nearby. However, this is still much safer than risking electric shock, since the chance of an out-of-control fire is remote. Where live circuits must be frequently worked on (e.g. television repair), an isolation transformer is sometimes used. Unlike ordinary transformers which raise or lower voltage, the coil windings of an isolation transformer are at a 1:1 ratio which keeps the voltage unchanged. The purpose is to isolate the neutral wire so that it has no connection to ground. Thus, if a technician accidentally touches the live chassis and ground at the same time, nothing would happen. Neither ground fault interrupters (RCD/GFI) nor isolation transformers can prevent electrocution between the live and neutral wires. This is the same path used by functional electrical appliances, so protection is not possible. However, most accidental electrocutions, especially those not involving electrical work and repair, are via ground—not the neutral wire. Electroconvulsive therapy or ECT is a psychiatric therapy for mental illness. The objective of the therapy is to induce a seizure for therapeutic effect. There is no sensation of shock because the patient is anesthetized. The therapy was originally conceived of after it was observed that depressed patients who also suffered from epilepsy experienced some remission after a spontaneous seizure. The first attempts at deliberately inducing seizure as therapy used not electricity but chemicals; however electricity provided finer control for delivering the minimum stimulus needed. Ideally some other method of inducing seizure would be used, as the electricity may be associated with some of the negative side effects of ECT including amnesia. ECT is generally administered three times a week for about 8-12 treatments. As a treatment for fibrillation or irregular heart rhythms, using what is called a defibrillator. As a method of pain relief, using what is called a Transcutaneous Electrical Nerve Stimulator (or a TENS unit). As an aversive punishment for conditioning of mentally handicapped patients with severe behavioral issues. This method is highly controversial and is employed at only one institution in the United States, the Judge Rotenberg Educational Center. The institute also uses electric shock punishments on non-handicapped children with behavioral problems. Whether this constitutes legitimate medical treatment versus abusive discipline is the subject of ongoing litigation. Electric shocks have been used as a method of torture, since the received voltage and amperage can be controlled with precision and used to cause pain while avoiding obvious evidence on the victim's body. Such torture usually uses electrodes attached to parts of the victim's body. Another method of electrical torture is stunning with an electroshock gun, such as a cattle prod or a taser (provided a sufficiently high voltage and non-lethal current is used in the former case). The National Socialists are known to have used electrical torture during World War II. During the Vietnam War, electric shock torture is said to have been used by both Americans and Vietnamese. Amnesty International published an official statement that Russian military forces in Chechnya tortured local women with electric shocks by connecting electric wires to their bra straps. Japanese serial killer Futoshi Matsunaga used electric shocks for controlling his victims. Advocates for the mentally ill and some psychiatrists such as Thomas Szasz have asserted that electroconvulsive therapy is torture when used without a bona fide medical benefit against recalcitrant or non-responsive patients. See above for ECT as medical therapy. These same arguments and oppositions apply to the use of extremely painful shocks as punishment for behavior modification, a practice that is openly used only at the Judge Rotenberg Institute. Low- to moderately high-voltage electric shocks do not result in the type of pain felt at death or organ failure, nor have been proven to result in "significant psychological harm of significant duration, e.g., lasting for months or even years." Electric shock delivered by an electric chair is sometimes used as an official means of capital punishment in the United States, although its use has become rare in recent times. Although the electric chair was at one time considered a more humane and modern execution method than hanging, shooting, poison gassing, the guillotine, etc., it has now been replaced in countries which practice capital punishment by lethal injections. Modern reporting has claimed that it sometimes takes several shocks to be lethal, and that the condemned person may actually catch fire before the process is complete. The brain is always severely damaged and inactivated. Other than in parts of the United States, only the Philippines reportedly has used this method, and only for a few years. It remains a legal means of execution in a few states of the USA. In 1993, there were 550 electrocutions in the United States, which translates to 2.1 deaths per million inhabitants. At that time, the incidence of electrocutions was decreasing. Electrocutions in the workplace make up the majority of these fatalities. From 1980–1992, an average of 411 workers were killed each year by electrocution. ↑ Electric Stunning of Pigs and Sheep. grandin.com. Retrieved January 5, 2009. ↑ Industry Backs IEEE-NFPA Arc Flash Testing Program With Initial Donations Of $1.25 Million. IEEE. Retrieved January 5, 2009. ↑ 3.0 3.1 Publication No. 98-131: Worker Deaths by Electrocution. National Institute for Occupational Safety and Health. Retrieved January 5, 2009. ↑ Dangers of electricity. Arizona State University. Retrieved January 5, 2009. ↑ Philippe Morel, 1999, Line Maintenance Reaches New Heights. Transmission & Distribution World. Retrieved January 5, 2009. ↑ Darius Rejali, 2007. Torture, American style: The surprising force behind torture: democracies. Boston Globe. Retrieved January 5, 2009. ↑ Russian Federation Preliminary briefing to the UN Committee against Torture. Amnesty International. Retrieved January 5, 2009. ↑ Jay C. Bybee, Bybee Torture Memo- The Full Text. tomjoad.org. Retrieved January 5, 2009. ↑ State by State Information. Death Penalty Information Center. Retrieved January 5, 2009. Brogdon, B.G., Hermann Vogel, and John D. McDowell. 2003. A Radiologic Atlas of Abuse, Torture, Terrorism, and Inflicted Trauma. Boca Raton, FL: ISBN 0849315336. Institution of Electrical Engineers. 1999. Protection Against Electric Shock. London, UK: Institution of Electrical Engineers. ISBN 0852969589. Kneeland, Timothy W., and Carol A.B. Warren. 2008. Pushbutton Psychiatry: A Cultural History of Electric Shock Therapy in America. Walnut Creek, CA: Left Coast Press. ISBN 1598743635. National Institute for Occupation Safety & Health: Worker Deaths by Electrocution – a CDC study. This page was last modified on 18 September 2017, at 21:47.